Wearables aren’t setting the world on fire because most of us are still waiting for a compelling reason to buy one. That day might be coming sooner than you think. Samsung’s tiny new Bio-Processor promises to make health and fitness wearables smaller and lighter, while increasing functionality; and it’s now in mass production. Updated on 12-29-2015 by Andy Boxall: Added in news the Bio-Processor has reached mass production, more on functionality, and possible device launch dates. Samsung Electronics’ System LSI Business Department unveiled and demonstrated the Bio-Processor at the International System on Chip Design Conference in South Korea in November, then announced at the close of December the chip is already being produced in large numbers. We could be less than six months away from seeing the first products using the chip. It’s described as the first all-in-one health-based chip, and squeezes a host of sensors and tech onto its tiny frame. It has an electrocardiogram (ECG) reader, which means that it can measure your heartbeat, breathing rate, and level of stress. It can also detect your blood flow with the use of a photoplethysmogram (PPG) reader, plus measure your skin temperature, galvanic skin response, and body fat. All these signals are managed by the chip itself, which integrates all the power, processing, and memory circuits into one. The result is the Bio-Processor measures one-fourth of its total combined size, which means wearables using the Bio-Processor can be designed in new ways. All the collected health information is impressive enough, but the presence of the ECG provides another cool feature possibility. Our heartbeat is almost as unique as our fingerprint, and wearing a bracelet or smartwatch with Samsung’s Bio-Processor inside may mean you won’t have to enter a password for smart locks on your house or car in the future. To demonstrate its versatility, Samsung has produced reference design prototypes that use the Bio-Processor — such as a wrist band, a patch, and a board — and will sell the chip to other companies. 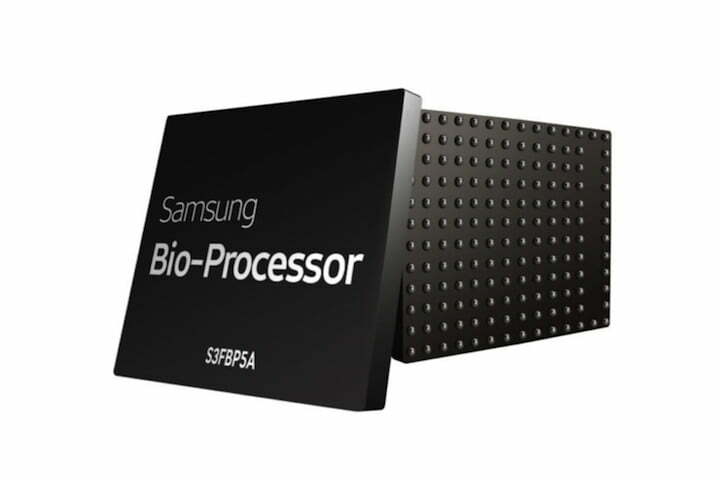 Now in mass production, Samsung expects the first Bio-Processor-powered devices to be revealed during the first half of 2016.